Quick Facts: One brownie with vanilla ice cream and fudge topping has 200 calories, 4 grams of fat, 3 grams of dietary fiber, and 5 grams of protein. Ingredients: These contain the longest ingredients list of any brownie on my list. The ingredients include artificial flavor and color. There’s not much real cocoa listed other than some cocoa powder. Then again, it’s not really a fair comparison since these have the ice cream and fudgey sauce that the others don’t. On the plus side, the flour is enriched with minerals, so you get some health benefits. Tastes Like: Chocolate cake with frozen creamy white stuff on top (good but not really an ice cream taste). The chocolate part tastes more like cake than a brownie to me. What I Liked: I like that you can microwave these and make them warm (don’t put them on for too long—you don’t want the ice cream to melt too much). But they don’t really taste like brownies, so they don’t really satisfy the brownie craving; they satisfy the cake craving, which is different! And if we’re going in that cake direction, I prefer the Smart Ones Double Fudge Cake. 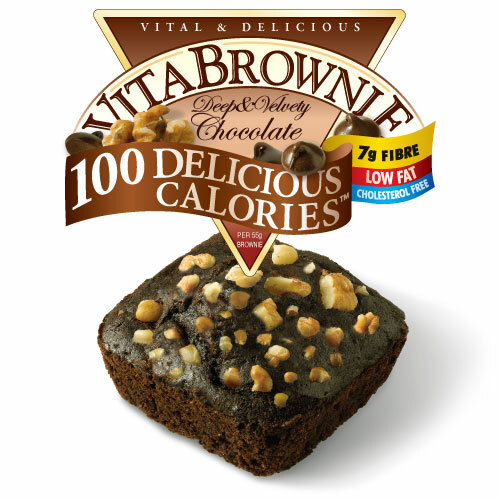 Quick Facts: One brownie has 100 calories, 2 grams of fat, 6 grams of dietary fiber, and 4 grams of protein. Ingredients: These include a lot of real ingredients such as whole wheat flour, egg whites, cocoa, organic evaporated cane juice, real chocolate chips, and walnuts. Bonus: there are lots of added vitamins and minerals. But note that these include maltitol, which has a laxatative effect on some people. Tastes Like: These remind me of the Smart Ones in that they are a bit more cake-like than brownie-like (not very fudgey or gooey). My friend thinks they taste a little cornbready. What I Liked: These make a pretty satisfying snack–one fills me up more than a Glenny’s. And it has tons of vitamins! What I Wasn’t Crazy About: These are a little grainy tasting and not super-chocolately. They might satisfy your hunger but not your chocolate craving. 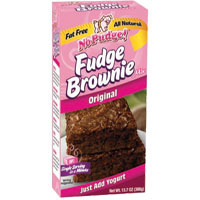 Quick Facts: One brownie has 120 calories, 0 grams of fat, 1 gram of dietary fiber, and 2 grams of protein. Ingredients: These are made with all-natural ingredients such as unbleached wheat flour, pure cane sugar, Dutch cocoas, and egg whites. The only thing you have to add to the baking mix is vanilla yogurt (or plain yogurt and vanilla flavor). SO easy! Tastes Like: These taste like real brownies! Hooray! They’re gooey and have a similar taste to Betty Crocker or Duncan Hines homemade brownies. What I Liked: I love that the box includes a recipe for how you can make just a single serving. Not everyone wants a whole tray of brownies to his/herself, and not everyone has chocoholics in the family who’ll want some. If you do want to make these for the family, throw out the box and trick your family into believing they’re Duncan Hines. These are so good that your family might not be able to tell they’re fat free. What I Wasn’t Crazy About: These do take a bit more work than the frozen or ready-to-eat ones. (But they’re still easy!) Also, even though they’re not bad for you, they don’t have the added vitamins/health benefits that the VitaBrownies do. The Verdict: I’m not sure I have an absolute favorite; it depends on the situation. When I’m at work and I need an afternoon snack, I reach for the Glenny’s. When I have been eating crappily and I want to be good to my body, I eat the VitaBrownies. 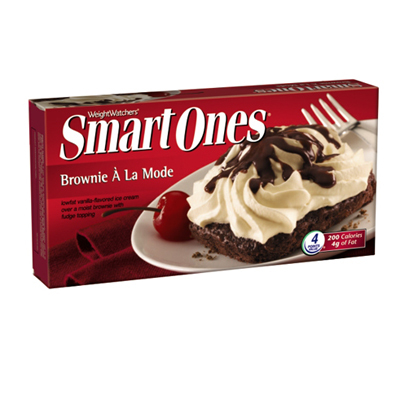 When I want something fun and pretty to eat, I dig into a Smart Ones. And when I want something that tastes the most like an actual brownie, I make the No Pudge ones!